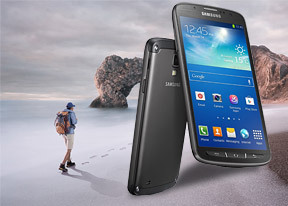 The Samsung Galaxy S4 Active has an 8MP camera, which is borrowed from the Galaxy S III rather than Galaxy S4. It captures photos of up to 3264 x 2448 pixels. There's a 1.9MP camera on the front, but there's no dual-shot mode like on the Galaxy S4. The user interface is based on the Galaxy Camera interface. A virtual shutter key and a capture video button are always available in the viewfinder, so you don't have to switch modes. However, this is certainly not the most convenient solution as, if you're shooting full resolution 8MP photos, you'll have to frame your videos using a 4:3 viewfinder. The Mode button brings up a carousel with different shooting modes, each mode comes with a descriptive image and text. When you get familiar with those modes, you can switch to the grid, which drops the descriptions but is faster. There are more settings in the top left corner, but they won't be used very often. Still, there're a number of interesting options here like the setting for the volume rocker to act as a still shutter key, a video shutter key or a zoom lever. Another interesting option is contextual file names - the Galaxy S4 Active will name photos with your location (the GPS needs to be on for this to work). You can customize the shortcuts available here, but most people will probably stick to the Mode selector. There are relatively few manual settings, the Galaxy S4 Active just gives you an ISO setting, white balance and exposure compensation. Let's go over the different modes. The Aqua mode is unique to the rugged phones in the Galaxy lineup and optimizes camera settings for underwater shooting. Be sure the set the volume rocker as camera shutter key instead of trying to use the touchscreen underwater. Then there are standard modes like Rich Tone (HDR), Panorama, Night and Sports. Panoramas are not as impressive as on the Galaxy S4 - they come out with about 1200px vertical resolution (lower if you don't hold the phone steady). Other modes we've seen on previous Samsung phones like Best Photo and Best Face, which snap multiple photos and let you pick the best one (in the case of Best Face, you can tweak each face in the photo individually). Beauty Shot does some automatic touch up. Then we get into the more interesting shots. Eraser helps you remove moving objects (e.g. passers by walking into your shot). Drama mode takes a moving object and clones it several times. Note that the resolution for this mode drops to 1080p. Sound & shot captures a photo and records ambient sound. It sounds pretty cool - for example, you can hear the sea gulls in a beach photo or the roaring of car engines at a race - but we had problems sharing the shot, all the Galaxy S4 Active would send is the still image, a JPEG and no sound. The Cine photo feature has been renamed Animated photo and records several seconds of footage and then creates a looped GIF. You can trim the animation and control how it is looped. Here's a sample of what that looks like (size warning: this GIF alone is over 20MB, a 1080p video clip of the same will be smaller). Overall, Samsung has copied most of the features of the Galaxy S4 camera, but left out some of the premium options - the 360 photo (Photo Sphere) is missing and there's no dual-shot or color effects. We'll reserve image quality discussions for the review, until then here are a few samples.